Magnusson Klemencic Associates won ACEC Washington’s platinum award for its work on the Frank Gehry-designed BioMuseo, a biodiversity museum in Panama City, Panama. Magnusson Klemencic Associates has earned the top honor in the 46th Annual Engineering Excellence Awards, sponsored by the American Council of Engineering Companies of Washington. 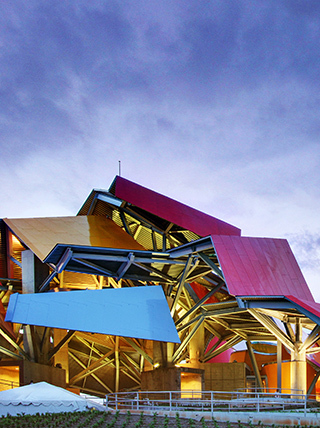 MKA was the structural engineer for BioMuseo, a Frank Gehry-designed biodiversity museum located at the gateway to the Panama Canal. ACEC Washington honored 31 projects representing a wide range of engineering achievements. The top six awards (one platinum and five gold) will go on to compete in the ACEC national competition in Washington, D.C., in April. The five-member judging panel consisted of “engineer emeritus” and lead judge Jeff Daggett, PE, FACEC; Butch Brooks, president of AGC of Washington and owner of Brooks Construction Management; Debbie Sullivan, assistant public works director, city of Olympia; Michael Terrell, major projects director, Seattle Department of Transportation; and Ben Minnick, construction editor, Seattle Daily Journal of Commerce. Projects were rated on their complexity; perception by the public; uniqueness and innovations; future value to the engineering profession; contributions to social, economic and sustainable development; and fulfillment of client/owners’ needs.